System Stable permits continuous discharge of a preset (adjustable) amount of water. If this amount is used in a single discharge, an alarm is issued and the water supply is cut off. The monitor employs two sets of limiting values for High and Low consumption periods respectively. System Stable permits peak flow up to a preset (adjustable) value. If this value is exceeded	for some (adjustable) time, an alarm is issued and the water supply is cut off. The monitor employs two sets of limiting values for High and Low consumption periods respectively. System Stable permits mean flow up to a preset (adjustable) value. If this value is exceeded, an alarm is issued and the water supply is cut off. The monitor employs two sets of limiting values for High and Low consumption periods respectively. System Stable permits daily consumption of a preset amount of water. If consumption exceeds this amount, an alarm is issued; if desired the water supply will be cut off. System Stable checks that the water flow can drop below a preset (adjustable) value for a preset (adjustable) amount of time, and issues a seepage alarm if this fails to occur daily; if desired the water supply will be cut off. System Stable exercises the cut-off valve daily, at the same time checking tightness of the closed valve. If this is insufficient, an alarm is issued; water supply is not cut off. 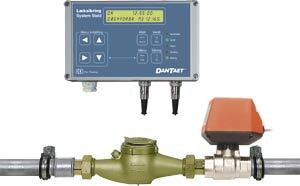 System Stable accepts the flow meter standing still up to a preset (adjustable) amount of time. If this is exceeded, an alarm is issued; water supply is not cut off. System Stable continuously monitors mains and all internal power supplies. If any of these fails, an alarm is issued; water supply is not cut off. Indicators for water consumption, valve status, alarm, warning and protection status; 2x20 LCD display for readout; buttons for manual valve control, alarm acknowledge, protection on/off; menu-, navigation- and parameter setting keys; buzzer. Digital input for remote protection on/off switch. Alarm relay with selectable response for certain alarm types. Signal relay for remote reading or external indication of Protection Status. Valve relay for cut-off valve. Digital optoisolated output for repetition of (direct or scaled) meter impulses to other monitoring systems (e.g. FarmWatch).